A complete online Product Catalog of chemicals, supplies, accessories, and equipment for Electron and Light Microscopy, Histology, Cell Biology, Neuroscience, and all biological related research fields. At the site, you can find technical tips and recommended articles of interest, technical and product data sheets, Material Safety Data Sheets, and many revolutionary new products and exclusive items. Workshops, One-on-One Training, and Equipment Demos - ranging from a general introduction to the field of electron microscopy to very specific techniques. Located in Hatfield, PA, our Academy houses several laboratories allowing students to get hands-on training in SEM, TEM and Wet Labs with state-of-the-art equipment. Sign up today! A complete product catalog of the entire Diatome collection of Diamond knives, tools, and accessories for Electron and Light microscopy for Biological and Materials Science at room and cryo temperatures. Available on-line as well is information on our services, programs, specials, and policies. The complete handling and use technical manual as well as troubleshooting can also be found at our site. The Summers Optical on-line catalog including a complete line of optical cements and adhesives, decementing agents, hardness testers, ultrasonic baths and UV lights as well as technical and transmission data and problem solving can be found at this site. As well as, our unique bonding manual including troubleshooting and charts for how to choose a cement for specific applications and a complete set of MSDS on all of our products can be seen here. We are pleased to announce that we have purchased Citifluor, Ltd., and have taken over the complete manufacturing and distributing of the Citifluor™ line of products. Feel free to contact us with any questions. Take a look at the Citifluor line. 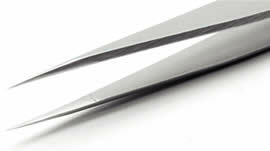 We are pleased to announce that we are the proud distributors of Ideal-tek tweezers and instruments. Ideal-tek is committed to quality with the perfection of its products since being established in Switzerland in 1964. Ideal-tek is one of the world's leading manufacturers of precision hand tools and instruments. Take a look at the many varieties available. The EMS Swiss Personal Line of Tweezers from Rubis merges precision engineering with ultra-modern technology. Made in Switzerland exclusively for Electron Microscopy Sciences, these tweezers are hand-selected by our experts for your specific requirements. EMS Contract Packaging is a total service contract manufacturer, packager, and formulator, with over 40 years of experience in drug and cosmetic formulating and packaging. EMS will make your idea a reality, whether large or small, with attention to detail, precision and punctuality. Negafile furniture quality wood filing systems and storage cases for grids, negatives, film and microscope glass slides. And a full line of shipping and packaging solutions for all your traditional or digital media.